Postural Drainage removes mucus from certain parts of the lungs by using gravity and proper positioning to bring the secretions into the throat where it is easier to remove them. 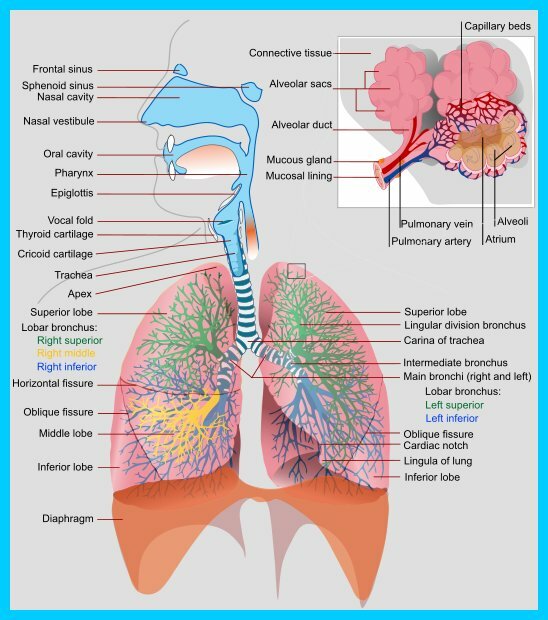 The lungs are divided into segments called lobes, the right lung is divided into three lobes (right upper lobe, right middle lobe and right lower lobe) while the left lung has only two lobes (left upper lobe and lower lobe). The treatment often works best in the morning. This allows the mucus to be removed that has built up during the night. Sometimes a treatment can be done at night to reduce the need for coughing during sleep. Make sure you wait at least 1-2 hours after eating before starting you treatment. This helps to prevent nausea and or vomiting. CPT just before meals may cause you to become tired and may decrease appetite. 1. Use specific positions so the force of gravity can assist in the removal of bronchial secretions from affected lung segments to central airways by means of coughing and suctioning. 2. The patient is positioned so that the diseased area is in a near vertical position, and gravity is used to assist the drainage of specific segment. 3. The positions assumed are determined by the location, severity, and duration of mucous obstruction. 4. The exercises are performed two to three times a day, before meals and bedtime. Each position is done for 3-15 minutes. 5. The procedure should be discontinued if tachycardia, palpitations, dyspnea, or chest occurs. These symptoms may indicate hypoxemia. Discontinue if hemoptysis occurs. 6. Bronchodilators, mucolytics agents, water, or saline may be nebulised and inhaled before postural drainage and chest percussion to reduce bronchospasm, decrease thickness of mucus and sputum, and combat edema of the bronchial walls, there by enhancing secretion removal. 7. Perform secretion removal procedures before eating. 8. Make sure patient is comfortable before the procedure starts and as comfortable as possible he or she assumes each position. 9. Auscultate the chest to determine the areas of needed drainage. 10. Encourage the patient to deep breathe and cough after spending the allotted time in each position. 11. Encourage diaphragmatic breathing through out postural drainage: this helps widen airways so secretions can be drained. If a hospital bed is available, put in Trendelenburg position (head lower than feet). Place 3-5 wood blocks, that are 2 inches by 4 inches, in a stack that is 5 inches high, under the foot of a regular bed. Blocks should have indentations or a 1 inch rim on top so that the bed does not slip. Stack 18-20 inches of pillow under hips. Place on a tilt table, with head lower than feet. Lower head and chest over the side of the bed. To drain the upper portions of your lungs, you should be in a sitting position at about a 45 degree angle. Postural drainage therapy is designed to improve the mobilization of bronchial secretions and the matching of ventilation and perfusion, and to normalize functional residual capacity (FRC) based on the effects of gravity and external manipulation of the thorax. This includes turning, postural drainage, percussion, vibration, and cough. Turning is the rotation of the body around the longitudinal axis to promote unilateral or bilateral lung expansion and improve arterial oxygenation. Regular turning can be to either side or the prone position, with the bed at any degree of inclination (as indicated and tolerated). Patients may turn themselves or they may turned by the caregiver or by a special bed or device. Postural drainage is the drainage of secretions, by the effect of gravity, from one or more lung segments to the central airways (where they can be removed by cough or mechanical aspiration). Each position consists of placing the target lung segment(s) superior to the carina. Positions should generally be held for 3 to 15 minutes (longer in special situations). Standard positions are modified as the patient's condition and tolerance warrant. Percussion is also referred to as cupping, clapping, and tapotement. The purpose of percussion is to intermittently apply kinetic energy to the chest wall and lung. This is accomplished by rhythmically striking the thorax with cupped hand or mechanical device directly over the lung segment(s) being drained. No convincing evidence demonstrates the superiority of one method over the other. Vibration involves the application of a fine tremorous action (manually performed by pressing in the direction that the ribs and soft tissue of the chest move during expiration) over the draining area. No conclusive evidence supports the efficacy of vibration, the superiority of either manual or mechanical methods, or an optimum frequency. -presence of atelectasis caused by or suspected of being caused by mucus plugging. -presence of foreign body in airway. The decision to use postural drainage therapy requires assessment of potential benefits versus potential risks. Therapy should be provided for no longer than necessary to obtain the desired therapeutic results. Listed contraindications are relative unless marked as absolute (A). 1-Presumed effectiveness of PDT and its application may be based more on tradition and anecdotal report than on scientific evidence. The procedure has been used excessively and in patients in whom it is not indicated. 2-Airway clearance may be less than optimal in patients with ineffective cough. 3-Optimal positioning is difficult in critically ill patients. These represent individual criteria that indicate a positive response to therapy (and support continuation of therapy). Not all criteria are required to justify continuation of therapy (eg, a ventilated patient may not have sputum production > 30 mL/day, but have improvement in breath sounds, chest x-ray, or increased compliance or decreased resistance). If sputum production in an optimally hydrated patient is less than 25 mL/day with PDT the procedure is not justified. Some patients have productive coughs with sputum production from 15 to 30 mL/day (occasionally as high as 70 or 100 mL/day) without postural drainage. If postural drainage does not increase sputum in a patient who produces > 30 mL/day of sputum without postural drainage, the continuation of the therapy is not indicated. Because sputum production is affected by systemic hydration, apparently ineffective PDT probably should be continued for at least 24 hours after optimal hydration has been judged to be present. With effective therapy, breath sounds may 'worsen' following the therapy as secretions move into the larger airways and increase rhonchi. An increase in adventitious breath sounds can be a marked improvement over absent or diminished breath sounds. Note any effect that coughing may have on breath sounds. One of the favorable effects of coughing is clearing of adventitious breath sounds. The caregiver should ask patient how he or she feels before, during, and after therapy. Feelings of pain, discomfort, shortness of breath, dizziness, and nausea should be considered in decisions to modify or stop therapy. Easier clearance of secretions and increased volume of secretions during and after treatments support continuation. Moderate changes in respiratory rate and/or pulse rate are expected. Bradycardia, tachycardia, or an increase in irregularity of pulse, or fall or dramatic increase in blood pressure are indications for stopping therapy. Resolution or improvement of atelectasis may be slow or dramatic. Oxygenation should improve as atelectasis resolves. Resolution of atelectasis and plugging reduces resistance and increases compliance.